Description: The Lexington Switcher is working the High Point Thomasville & Denton RR interchange in High Point, NC. The HPT&D shops/office is to the left of the train. Today the HPT&D operations are conducted as part of the Winston-Salem Southbound Railway anmd shop has since been demolished. Description: NS Westbound Freight Train passing through Carrollton, Mo. running via trackage rights over BNSFs Marceline Sub into Kansas City, Mo. Description: I encountered this engine while walking around on the streets. 5182 was doing switching duty near the old Bath mill. Description: Well this was aewsome because over a year ago this engine was my first ever railfan shot and it was serving on loacl p22. Well it returned and was serving on local p22 again. Here we see 5182 parked on the spur line in bath next to LBC middle school. Description: This is the lettering on NS 5182 and if you look real good you can see old lettering showing through the newer NS paint. 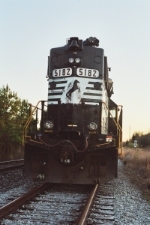 This makes me think that Southern used stickers for their lettering and when Southern Merged into Norfolk Southern they painted over stickers. The picture on the left shows the numbers but notice that there's a bit of gold numbering showing above the NS numbering. Also notice that threre's a "F" beside it. This means this unit was 5182F back in its SOU days. Now the right side picture shows a few sou lettering stickers bearing on the long hood of 5182. You can see the letters "H, E, R, N" bearing through the NS paint. I looked at the back of the engine and I saw what looked like the old SOU logo showing through the NS horse but didn't have any time to get a shot of that part. So from now on whenever you encounter some old SOU power if you can try and get a closer look because you might find stuff like this because I have a feeling many old SOU units are bearing lettering. Title: NS 5182 direct sunlight. Description: A local job arrives off the M-Line and ties up in the small High Point yard. Check out he old Southern numbers starting to show through on the cab! Description: P61 turns west at Salisbury with a nice lashup of a GP60 and six GP38-2s. Description: A former Southern Railway GP38-2 and a former Conrail GP38-2 respectively await their next local assighnments at East Durham. Description: A former Conrail GP38-2 and a former Southern Railway GP38-2 respectively await their next local assighnments at East Durham. Description: Local P83 gets ready to depart from Rock Hill, SC and head to Chester to switch the L&C interchange. Title: P83 at Chappel Rd. Description: P83 approaching Chappel Rd, MP R34. Description: Getting ready to work the L&C Interchange. Description: Take 'em ahead 5. Description: Heading back to Rock Hill, P83 hammers through Henley with 5038 doing the honors long hood forward, as the Southern intended. Description: NS 5182 leads P42 past Magnolia Street. Description: NS Local P95 rolls railroad-South down the South Newton Lead (former C&N-W) past the Southeastern Narrow Gauge & Shortline Museums campus on its way down to Renwood Mills. Title: Flour train or flower train? Description: NS Local P95 rolls down the South Newton Lead past the Southeastern Narrow Gauge & Shortline Museums Newton Depot just behind the photo. The train is hauling flour/cornmeal to Renwood Mills down the line.